It does not matter to TrendProphecy FX if it's a Bull or Bear market. No matter how the market is behaving, TrendProphecy FX gives you Long and Short signals. TrendProphecy FX makes it easy for you to trade with the short-term trend and earn an advantage throughout the trading week - trading one or more Pair's. Subscribers are never in doubt, Entry Points and Alerts updates dynamically with positions color coded - Blue/Buy, Red/Sell and Warning. 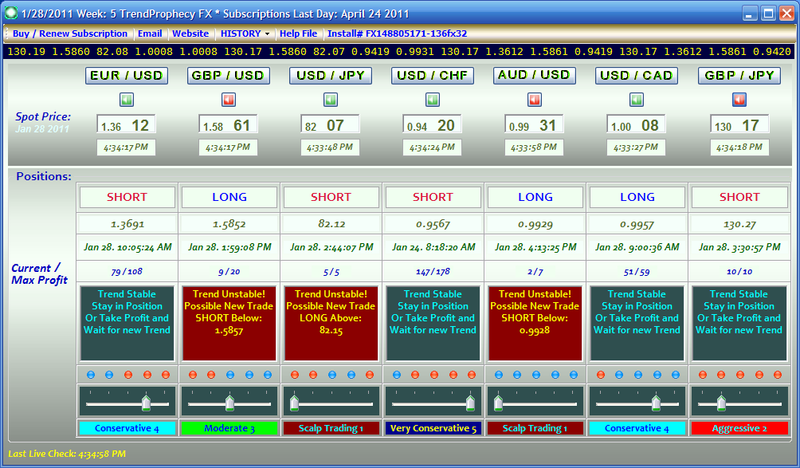 The TrendProphecy FX's trading method developed especially for the professional Currency or Arbitrage Day trader differs from other systems, in that it computes a confirmed entry signal, using our proprietary algorithms - and then eventually during the Trend a warning (Alert) is shown if/when the Trend becomes unstable, which is not the same as a change of the Trend. TrendCatch compute live trading Trend signals for S&P500 E-mini Futures. Qweas is providing links to TrendCatch FX 4.0 as a courtesy, and makes no representations regarding TrendCatch FX or any other applications or any information related thereto. Any questions, complaints or claims regarding this application TrendCatch FX 4.0 must be directed to the appropriate software vendor. You may click the publisher link of TrendCatch FX on the top of this page to get more details about the vendor.